Submitted by Barry on Wed, 1969-12-31 19:59. Appetizer - When was the last time you had your hair cut/trimmed? I'd say it's been about a month. Generally I get a haircut every month-1/2, so I'm due pretty soon. Soup - Name one thing you miss about being a child. Saturday morning block cartoons. Looking forward to every Saturday morning, I'd get up in my jammies, fix a bowl of cereal and watch Casper, Funky Phantom, Scooby Doo, Captian Caveman, Sid & Marty Krofft shows, Jason of Star Command, Shazam!, whatever else was running at that time, until American Bandstand came on around 12 or 1. And that was my time. Salad - Pick one: butter, margarine, olive oil. I love butter and margarine. I don't particularly care to know how margarine is made now that I saw an special on the Food Network about how they make Country Crock, but it's still good... Olive oil is a relatively new entry onto my palate and I'm still evaluating its qualities. Main Course - If you could learn another language, which one would you pick, and why? I took several years of French in high school and college and can understand/speak smatterings of it still. My kids have taken French in elementary school and it's been fun to learn some of it again with them. I'd love to be able to speak it fluently. It's such a gorgeous language and sounds great just to listen to. In 5 years I expect to be getting Brainyboy ready for graduation and college selection, plus dealing with the trauma of a teen-aged Tink really hitting puberty. I also expect to be in the same job I am now - hey, I'm going on 11 years in this job already - why stop? I'm podcasting once again with RexandTheBeast.com! Rex and the Beast and I are again discussing theme parks: this time we talk about the recent sale of Anheiser Busch to a foreign company and its possible ramifications to the Busch-owned theme parks across the country including Busch Gardens: Europe in Williamsburg (see video tour). We wax philosophical about what make roller coasters great, the future of theme park rides, the relative merits of virtual vs. interactive rides, future plans for shooting the exciting sequel Mission: IOA 3 (watch Mission IOA and Mission: IOA 2 - Universal Revenge), and as an added bonus also chat about bass fishing in the south of France. I still have no idea what that's all about. Anyway, check it out - Audio Journeys with RexandTheBeast.com. Last night my wife and I had a "date night". It was great - dinner at Altruda's (great Italian place for you non-Knoxvillians), then went to Downtown West to see the new Helen Hunt/Bette Midler movie. I haven't been to Downtown West in years, so it was fun to see the old haunt again. I remember seeing Star Trek II: The Wrath of Khan there, lo these many years ago - and also Star Trek VI: The Undiscovered Country with Big Orange Michael. But I digress. The movie was over around 10pm, and as Laura and I started to get in our car a pickup/SUV pulled up beside me. Driving was a clean-cut, mid-20's young man who was nicely dressed. Beside him in the passenger seat - a less than neatly dressed, slightly unsavory looking gentleman who kept his head down during the entire conversation. The driver pulled up and asked me for a moment of my time through his open window. He assured me - repeatedly - don't be scared, he's not up to anything. He told me his wife had just miscarried in Dandridge, his other child had cerebral palsy, he worked in a security systems business, and he just needed some gas money to get to Dandridge. He was very polite, yet fairly insistent. A couple things flashed through my mind immediately. First I was glad Laura was on the other side of the van and blocked physically from the guys in the truck. She also (unknown to me) was getting her own car keys and the cell phone ready in case of trouble. Second, I thought quickly about his story: wife just miscarried? in Dandridge? and you have a kid with Cerebral palsy? Security systems? Sounds like a lot of unfortunate coincidences at once, and almost too many specific details about his life to start off a plea for assistance. Thirdly, I thought if you're running too low on gas to get to Dandridge (which isn't that terribly far away from Knoxville, really) why are you wasting gas driving around anonymous dark parking lots at night asking strangers for gas money when it would make more sense to take off for home immediately upon receiving word of the trouble. Or better yet, call someone from home to come and get you. More and more illogical circumstances. Fourth, I tried to recall any shelters or churches nearby in West Knoxville that migth be available, but there really aren't - all the homeless shelters are downtown, and no churches would be open this late at night on a Thursday. Fifth, I tried to remember where a gas station was nearby that I could direct him to drive to, where I would safely pay for his gas. I'm not terribly familiar with the Downtown West area anymore, at least in remembering where nearby gas stations are, and I didn't want to stand there giving them more time alone with us while I racked my brain for the nearest Weigels or Pilot. Sixth, I thought if they needed some gas money they should just go to the box office of the theatre nearby. Much better than hitting up random anonymous folks in a dark parking lot. So I politely told him, sorry, I couldn't help him. He hesitated, started to say something else, then thanked me and drove off. We quickly got in the van and locked the doors, just in case. Laura scanned the area to see where they'd driven off to but we couldn't find them. We left and went home. I'll also just say this - buddy, if everything you told me was true (or even most of it), I apologize. I sincerely hope and pray you got your gas money, you made it home and tended to your family. Although I hate that your wife may have miscarried, that your child has CP, I almost hope that story was legit because the alternative is pretty scary. And that if real life situation like that happens to anyone else, they'll have the sense not to hit up total strangers in a parking lot and contact someone in some kind of public setting. 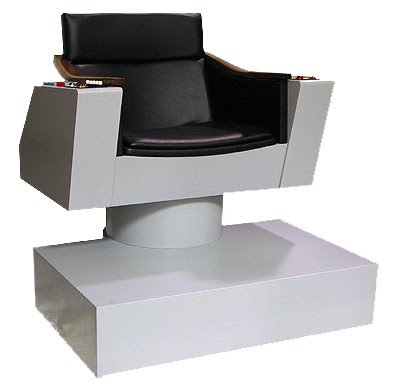 According to CBS the life-sized chair is a "fully operational replica" of the captain’s chair from Star Trek The Original Series using "expert measurements and the highest quality durable materials." This replica is actually a real piece of furniture, complete with lights, sound effects and built in phrases from the original Captain Kirk himself. It'll only set one of you loyal readers out there back about $2000 from Diamond Select Toys. But think of it as an investment in the happiness of your humble blogger. BOM, I'll even let you sit in it! Oh, and don't forget - you can still get me this, too. The unending man-eating pollution that permeates Beijing - (6/10) Although feared to be a serious respiratory problem before the games, it doesn't seem the smog is having that much of an effect on the athletes. And most every outdoor shot I've seen of competition (beach volleyball, cycling, the Today Show's ratings) the sky has been crystal clear. Must be like those mysterious "Orange Alert" days we keep having in Knoxville which seem to neatly coincide with our nicest, low-humidity days. Fake fireworks in the Opening Ceremonies - (2/10) The fireworks actually happened, they just showed a CGI-enhanced version to the audience and on TV because it was unsafe for a helicopter to film them live in the air. This is something that was blown up a bit out of proportion. Lip-synching kid in the Opening Ceremonies - (5/10) This is more of an embarrassment for the host nation than the fireworks, in that the real little girl who sang the nice anthem was judged "not cute enough" and "didn't present the appropriate face of the country" by some high-ranking yahoo of the Chinese Politburo. When in fact I and most everyone I've talked to thought both little girls were quite sweet-looking. Kids aren't supposed to be beautiful, they're supposed to look like kids (I know, I know, see "Lu, Libby") The Chinese Government's Propaganda Department surfaces in full force. Conscripted performers from Chinese Military in Opening Ceremonies - (7/10) If this is true, and I've just heard it in passing and haven't confirmed it as yet, it's deplorable that the Chinese government required their soldiers to participate. Maybe it's more scary than deplorable, seeing the precision of those drummers and box-stamp-thingy-ers in such lockstep precision. But if true, and these participants were forced to perform...well, maybe they enjoyed it and were proud to do so. Still. Leaves a bad taste in my mouth. Bad form, China. Ineligible Female Chinese Gymnasts - (8/10) Chinese officials apparently scrubbed the actual birthdates of some of their female gymnasts, making them "officially" older than they actually wore and thus above the minimum age limit allowed to compete. Even when asked about their age, the little girls (some 12-14 passing off as 16+ year-olds) they are forced to lie. The cover-up is blatantly bad, since documents and publications from even earlier in the year have been found that specified their true age. Come on - listing a 13-yr-old girl's birthday as Jan 1, 1992? How obvious can you get, guys? I mean, there's arrogance and then there's arrogance. The Souped Up Pools - (4/10) The Chinese construced their swimming pools to increase performance by all competitors. From larger depth to enhanced lane dividers and gutters, all these should serve to raise the tide and affect all boats, as it were. So this is not so significant in affecting the competition as it is causing World and Olympic Records to fall. The new NASA swimsuits worn by the Americans may seem to be a more significant advantage not available to all other competitors. But the relative wealth of your country plays in to all training and equipment advantages, so that's just more of the same. Not a major deal, but very visible. Canada still hasn't medaled - (5/10) C'mon you guys up north, there are summer games - remember? Where's the Georgia Team - (1/10) I haven't seen a team from the Republic of Georgia (our motto: "Oh I Really, Really, Really Wish I Was in Dixie"). I think the Russian team killed them in the tunnel before their entrance. No seriously, I heard some of their athletes want to withdraw to return and fight for their country. I wonder if there will be any conflict between them and the Russians at the games? Just passed a convoy of four trucks from The Washington Group on Pelissippi Parkway, headed south. I guess toward the airport. Among many other things, they are in the business of nuclear and hazardous waste disposal services. 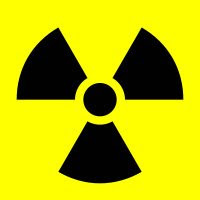 Which was pretty much confirmed by the big yellow "RADIOACTIVE" stickers on the sides of all the trucks. Yikes. I thought about taking a picture with my cell phone but was afraid some security goons would force me off the road and rough me up. That struck a chord with me, but not for the reason you might expect. There's a local radio station in town that broadcasts a show hosted by a husband and wife team. I don't want to name the show or link to it because I don't want to give them publicity. Occasionally I will tune in while in the car, mainly when one of my sports shows is at commercial, and also mainly to hear what they have to say about local issues (county government, schools, etc). But a lot of what I end up hearing (and fascinated with, in a watching-the-accident-as-you-pass-on-the-highway kind of way) is a lot of deep-seated contempt toward liberals. Now, I know you're thinking, "What? A conservative local talk show? In Knoxville??? Who whoulda thunk?" And as we all know there's nothing conservatives love better than bashing liberals (and vice-versa) so it's nothing really new here. Rush Limbaugh and Jeneanne Garafalo have turned this sort of thing into an art form. But there's always been something a little over-the-top about this particular radio show in its discussion style. There's haughty, and then there's haughty. There's contempt, and then there's contempt. Substitute the word "black" for "liberal" and you'd think you were listening to something from the 50's in Mississippi. In fact, they and some of their callers don't simply call them liberals - they're "Libs". "The Libs" say this, and "The Libs" do that. Insert your own racist-derogatory terms to understand the tone and bias that comes across on this radio show. And, to top it off, there's always a taste of Christian apologism that they bring to their broadcasts. They publicly avow their religious convictions (which I happen to agree with) yet their actions betray their beliefs. Here's the thing: they're perfectly free to broadcast whatever they like. Just because some of it rubs me the wrong way, that's my own thing to deal with. I can turn them off anytime I like. If they want to say how much they hate liberals - fine. That's totally their right to feel, and right to say. If they want to broadcast their opinions of whether gays might be immoral deviants (a policy they also seem to espouse) that's fine and totally within their rights as well. But people listen. And people learn. And people follow. And people act. The media's reach is wide and their influence is vast. People's capacity for tacking onto a movement or belief and letting their flames be fanned by those they listen to in the media is well-documented. When you speak publicly how much you hate certain groups of people, how certain groups of people are contemptible, and stupid, and how some barely deserve to exist in our society - the message I get from this radio show - then you have to understand that some people will be listening to you, and some people may agree with you. And here we are, a day after, dealing with the aftermath. Be careful what you say. Children Will Listen. One of the things I find hard about writing a blog and keeping it fresh is thinking of something interesting to say. There are plenty of bloggers that can always find a unique or noteworthy commentary to make about, well most anything. I've thought a good while about the shooting that happened here in Knoxville yesterday morning at a local church. At this point, 2 people have died, about 5 more are in serious or critical condition in the hospital, and the shooter is in custody. Signs are pointing to some kind of hate crime, whether against the church or Christianity or gays or whatever is still uncertain. I could have joined in the number of local blogs yesterday and "reported" on it but I didn't. I could have at least posted an "our thoughts and prayers go out to the victims and their families" post but I didn't. There wasn't anything new I could add that hadn't already been covered elsewhere, and sometimes to me the "thoughts and prayers" messages fall a little flat. That's just some of the dark cynicism I find in myself peeking out, I suppose. But I still felt I would be remiss if I didn't say something about it. I wouldn't be a proper Knoxville blogger. People might thing I was cold and heartless or uncaring. Let me tell you how I found out about it. During our 11 o'clock service yesterday at a Methodist Church only a few miles from Tennessee Valley Unitarian, our minister told the congregation. I was in the middle of a (discreet) conversation with a fellow sitting next to me and missed most of what the minister said. During the offertory, I pulled up local news on my cell phone and read what had happened. Still, the full impact didn't hit us until we got in the car after the service and listened to the local news-talk radio station, and got home and watched coverage on local TV. I logged into Twitter to follow local reaction, cruised around my Bloglines news feeds to see if any eyewitness accounts were being reported and then tried to put it out of my mind. Laura and I watched the finale of The Next Food Network Star, of which I already knew the outcome. Last night we attended our weekly small group session and discussed several points of the incident. Before my son went to sleep we prayed for the victims, their families and I especially included the shooter in the prayers. When I woke up this morning, I realized I'd been having disturbing dreams - I felt physically ill waking up - and upon reflection I think I'd been trying to make sense of everything while sleeping. Why? What if he'd come to our church? What would I have done? What systems are in place in Knoxville and Knox County by the government to warn local churches instantly that one man and maybe more could be targeting their Sunday morning worship services? How does this affect my views on guns? What can we do to make things safer? How do we forgive, how do we forget, how do we continue to live our lives in the shadows of gunmen? I don't know if my sleep will be any easier tonight. It certainly won't be for those involved and especially those kids. I can't imagine what would be going through my kids' heads if they'd witnessed something like that. Would I have had the courage to stand up and take a shotgun blast to protect my family and friends like Greg McKendry? Someone asked last night at small group - if you had the opportunity to live your life over again, would you do it? Do the high points outweigh the low points enough to make you want to do it all over again? I go to thinking about what a great childhood I had - I would live it over in a heartbeat. Now some kids, because of what happened yesterday, have an indelible stain on their childhoods. Something that hopefully a lot of love, attention, caring and maybe therapy may be able to soften. But it will never be erased. Thanks, mister, for proving to us once again it's a Hard Knock Life. Actually, my whole family is. Most of the time the TV is on in our living room. Sometimes we're actually home to watch it. While occasionally we actually sit down to watch a show, most of the time it was just some necessary white noise to our daily routine. But to have a consistent, non-offensive, bland-as-vanilla-pudding TV white noise, we had to pick a channel. Something non-controversial and one nothing would likely come on our kids couldn't see. And that maybe had some interesting shows. We chose HGTV - Home & Garden Television, produced by our own local near and dear Scripps Networks. Well, that went on for a while. We never really got into any of the shows, but it was nice to have something on the TV to just plop down, watch a few minutes of someone designing a deck or patio we'd never own, or refurbishing a rundown one-bedroom shack into a 10-bed, 9-1/2 bath McMansion. But we didn't really have a lot invested in it. The Food Network has taken over our lives. Oh! Glorious, the possibilities. The varieties! The worlds of culinary sophistication and innovation! Me, who for 40 years has barely been able to make more than a basic cheese sandwich without burning it have now realized that cooking could be....could be..... FUN? I've made the aforementioned quiche for a gathering of friends. I made Autumn Potato Gratin with cream and sage for Thanksgiving last year. I've been given cookbooks for Christmas, and made a fettucine with sausage tomato sauce, for goodness sake... I may just be getting good at this. But anyway, in honor of the season finale of our favorite Food Network show, The Next Food Network Star (airing this Sunday at 10pm EDT), I want to share with all of you the amazing shows we love to watch. Diners, Drive-Ins and Dives - Guy travels the country, profiling off the path, hole-in-the-wall restaurants with the best roadside food in the country. Not long ago he profiled a place on Magnolia Ave. in Knoxville that serves to die for onion rings, which I'm totally going to have to check out. 30-Minute Meals and $40 a Day are Rachel Ray's shows, and she of course is too perky for words. You just want to squeeze her cheeks. You pick which ones. Ahem. Anyway, she's friendly and enjoyable to watch (if she doesn't annoy you too quickly). Good Eats - I want to be Alton Brown. I want to host this show, and I think I'd be pretty darn good at it, too. I may start my own web version of this show, or something like it come to think of it. Anyway, Alton takes a particular aspect of food or cooking each episode and dissects in until you know its history, lineage, background, varieties, molecular structure, DNA sequencing and any other obsessive detail you can think of to say about, like, carrots. Or mac & cheese. Or pasta. Or tacos. Or whatever. This guy is great, and seriously, if I can find a topic I am so doing what this guy does as a vidcast on the web. Unwrapped takes a food product such as processed cheese, margarine, "comfort food", candy, cereal or other commercial product and shows how it's conceived, manufactured, and brought to the store's shelves. This one can be a little dry at times, but when it finds a subject that's really interesting it can be engrossing. Particularly something like candy bars. Dinner: Impossible - This season there's a new host, one of the Iron Chefs Michael Symon. I'm not totally sold on the new guy yet (he's only had one episode) but the concept of the show is fun. The host is given a task, obstensively by a "Mission: Impossible"-type voice, to prepare a huge meal for a large group of people in a set amount of time. He draws out the menu and is provided with a kitchen, the necessary food material, and a staff of chefs to help him out. It's the time limit and the setting that makes the show exciting - in the past the previous host (Robert Irvine, who was kicked off the show because it turned out he lied about his training and experience background) had to cook at a Renaissance Fair like they did in the past, cook for a Pixar gathering, passengers on a cruise ship, and more. The first new episode Michael cooked a huge meal for the workers on a Boardwalk, and had to "gourmet" up Boardwalk food for them. Good fun. Food Network Challenge - A competition between three-five chefs, usually pastry chefs, to create the best themed dish. Most of the time I watch this show, it's about cakes. Several chefs and their assistants have nine hours to completely create a cake based on, say, Disney villains, Pixar characters, classic cartoons, "most extreme", etc. Then they're judged on originality and style and the winner gets $10,000. The big challenge in these competitions is to not get too ambitious and try to do too much. One time Scar's (from "The Lion King") head fell off. And Mike and Sully from "Monsters, Inc." collapsed. You never know what's going to happen. Ace of Cakes - Ah, Duff, you big lug. The bald, goateed baker who frequently sports a backward baseball cap or toboggan in even the most formal of settings. He and the staff of Charm City Cakes (a real, honest-to-goodness special-order bakery in Philadelphia) spend every episode making all manner of cakes for $1,000 minimum order customers. Guitar-shaped cakes, cakes that look like the set of the play "Avenue Q", a cake of Hogwarts castle for the premiere of one of the Harry Potter movies, a Super Bowl Cake for Colts vs. Bears, armadillo cakes, shipping depot cakes, roulette wheel cakes, cakes that move, cakes that explode, cakes that look like Corvettes. But what makes this show great is the cast - Duff is the main guy, Geof is the soft-spoken and dry-witted main assistant. There's the red-headed receptionist that is the smart-alec, and several other young assistants that each have their own personalities. This is a winner. A couple of other shows on Foot Network I don't care for. I don't like Iron Chef America at all, nor can I stand anything with Paula Dean's face (or *shudder* voice) in it (sorry, mom). Emeril Live! was one of our favorites until his contract ran out and it went off the air. So check it out. If you already have an interest in cooking, or just the sociology of food in general, you may get stuck there. And if you have no interest in cooking, well watch it anyway! UPDATE: In researching links, I came across the site for The Next Food Network Star and they spoiled the finale! Interviews with the two people that didn't win are already up on their personal pages! So now I already know who wins... :( Bad form, Food Network.com. UPDATE II: Looks like they've taken down the videos that spoil the finale. It's safe to view the finalist pages again!